I’ve only played a few hours of Fallout 4's Far Harbour DLC so far and not had any issues, but for some there are some serious frame rate problems, apparently caused by the game’s fog and lighting. Bethesda hasn’t specified what “issues” it’s fixing, only that it's made “optimizations based on the Far Harbour beta feedback” and that it’s “actively working on more improvements”. The principle culprit currently seems to be that fog, with at least one person I know of forced to circle the DLC island to avoid the unplayable plunges in frame rate on going near the stuff. Obviously, that’s not much good. This posthighlights the tie between fog and frame rate, while the God rays have also been singled out with a PC user citing a “crazy performance boost” when they turned them off. This postalso noticed that the performance issues only really kicked in when looking at the trees, suggesting the volumetric lighting seemed to be more to blame than the fog itself. 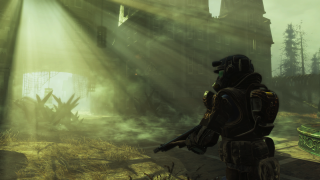 Overall, it looks like a combination of lighting and atmospheric effects are causing Fallout 4’s engine a few problems. Let's see what Bethesda can do to help.